Only 1500 sets available worldwide! The reissue OD-1, PH-1, and SP-1 are all built to the same exacting specs as the originals, with wiring and circuit adjustment carried out by hand with masterful precision. As well as maintaining the classic model's design, modern improvements have been implemented to cater to the demands of today's guitarists. You'll find a PSA-compatible power supply with built-in protection circuit and noise filter, a reinforced battery snap, and an LED on/off status indicator. The OD-1 is the Godfather of overdrive pedals; now a familiar fixture on many guitarist's pedalboards (in the form of the upgraded SD-1 released in 1981), but was a revolutionary pedal when it was introduced. The OD-1 delivered a smoother, warmer sounding overdrive than that of fuzz pedals available at the time. The subtle character of the OD-1 is what makes it so beloved by so many. Instead of overpowering your natural tone, it gives it the mid boost and bass response it deserves. Whether you want to give your amp a push, or act as a standalone stomp, the OD-1 can do it all. 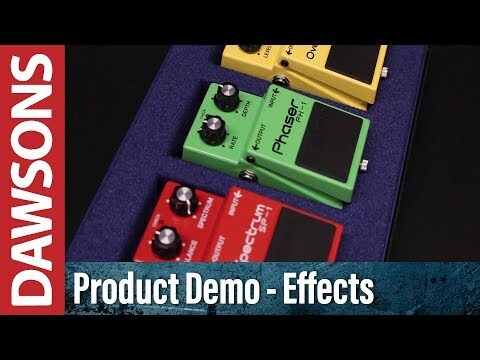 With the PH-1, BOSS engineers crafted a phaser that achieved a more natural, milder sound that complemented rather than coloured a guitarist's tone, thanks to improved clarity and a deeper modulation range than that of other phaser pedals. The reissue is equipped with FETs in the four phase-shifting circuits have been carefully matched to imitate those in the original design. The SP-1 is one of the rarest and most coveted of BOSS' releases. Taking its cue from an effect built into Roland's guitar and bass amps, the SP-1 is essentially a single-band parametric EQ with a fixed level boost. Adjusting the Spectrum knob creates a sweep across the centre frequency from 500Hz to 5kHz, and the Balance knob adjusts the direct/effect mix whilst maintaining a consistent level. Whether you're a guitarist or a bassist, you'll love the presence and sweep that the SP-1 has to offer.